Fulmanville is an ongoing project. Based around the thinking of Jean Baudrillard's Simulations, it focuses on decoding our environments. 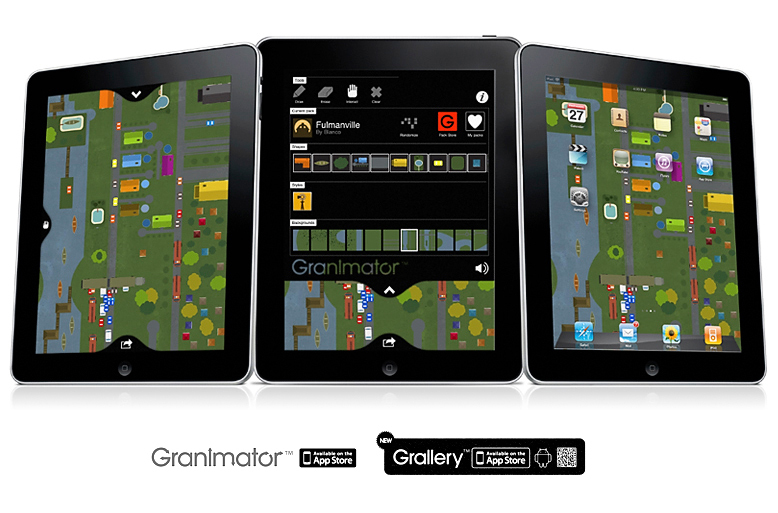 In 2010 I designed an iPad version with the Granimator™ department at ustwo™. Granimator™ is a creative sound based wallpaper creator—a free-form, immersive touch and sound experience that allows you to become the artist. The pack I created for them is called Fulmanville and is an extension of the ongoing town project that goes by the same name. Choosing from an assortment of architecture, roads, cars, vegetation and other elements, users build their own small neighborhoods within Fulmanville. Layer upon layer of "living environments" allows them to create perfection or create something sinister, disjointed and dystopian with the swipe of a finger. Once completed, the unique plans can then be uploaded to the Granimator™ Gralelry™ where they're available as free downloadable wallpaper for the iPhone or iPad. Below: Crops of my illustrated town, Fulmanville.